The “Buffy” board game was created in 2000, and as such reflects the plots and characters from early in the television show. First, all of the players are divided into the characters — one person is the selected “evil” person of that game, and the remaining people are each one of the Scoobies. 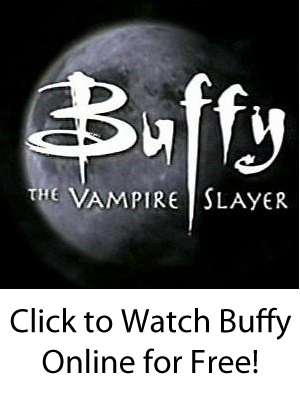 Depending on the chosen Big Bad, the goal of that particular game will be different (though it’s usually to kill Buffy or all of her friends as well). On each player’s turn, you roll the die and move your character and find items to help to fight the enemy-of-the-moment. If a moon symbol is rolled, the “time of day” icon is moved between various stages of day and night. For example, vampires who are outside are harmed when it becomes day, and Oz (the character portrayed by Seth Green) becomes a werewolf when it is a full moon. People draw cards when they land on colored spaces, and the cards relate to weapons, research spells, or help. When you use the cards, just do what the text says. The evil ones act differently in the “Buffy” board game. The “evil” player roles his specific die, and either the Big Bad or his flunkies move depending on if a large or small flame is shown. They can also draw from the “evil” set of cards by landing on a black space. Both the good and bad guys can attack each other when they are right next to each other. Battle is done by rolling red dice, and each resulting “punch,” “kick,” or “jab results in one life point being taken away. When the points are reduced to zero, the character (or vampire) is dead (or dusted). 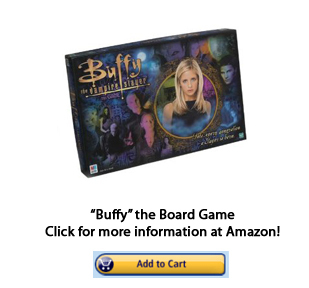 Note: The U.S. and U.K. versions of the “Buffy” board game are different.